I spend the majority of my fishing time either on wide-open tailwaters or in overgrown mountain streams. As a photographer, I often need to carry a heavy camera, as well as lunch, a rainjacket, etc. As a result, I’ve learned a few things about backpacks. 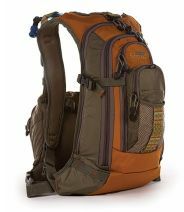 Generally, most fly fishing backpacks are quite good. 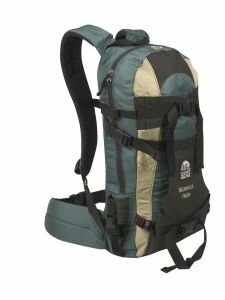 Fishpond‘s Double Haul system is collapsible, has a built-in water bladder capability (a must on long hikes), and is fairly lightweight. I like the pocket arrangement, which lets me stick my GPS in a separate, easily accessible pouch for quick access. However, I’m not wild about the chestpack (at least *as* a chestpack – it’s a great light flats bag slung over a shoulder). To me, chestpacks get in the way of looking at one’s feet; a very important factor when hiking boulder-strewn forest trails in the Appalachians. The Double Haul’s size is great for day hikes, but it’s a bit small if you need to carry anything more elaborate than lunch and a camera. The Double Haul also lacks external straps strong enough for a tripod, and it isn’t waterproof. Fishpond has larger systems (the Shooting Star is very nice), but fly fishing companies have a tendency to engage in what computer programmers call “feature bloat” when they have a bigger canvas. To me, there’s a limit to the number of pockets and straps a functional bag should have. One alternative comes from outside the fly market. 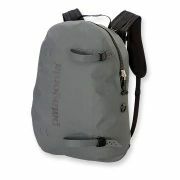 Granite Gear‘s line of snowboard and mountain rescue backpacks (some of them now discontinued, but still available) sport water-resistant finishes and zippers (which are quite effective even in heavy rain), as well as ski patrol-quality rubberized binding straps for nets, hiking poles, and even heavy tripods like a Manfrotto full-metal job. As a general purpose bag, you lose some of the small pockets that make items like split shot and balloons accessible, but you gain simplicity of use. Patagonia took the water-resistant concept up a notch when they designed their “highly water-resistant” (i.e. waterproof for everyone except lawyers) Stormfront pack; a grey jelly-bean made of similar ruggedized material to the Great Divider series of bags. I love the look of the Stormfront, especially for multi-day rafting excursions with portages, but I’m not sure this level of specialization would be useful on a daily basis. Further, the offset-to-the-side heavy-duty straps would tend to pull sideways with a 10 lb. tripod in them. Do you have a favorite fly-fishing backpack? Know of a non-fly-fishing bag that does the job better? Let us know in the Comments section!